After graduating in 2003 with a degree in Hospitality Management, I moved to Manchester where I spent two years working in various hospitality roles. In 2005, I made the move into the retail industry joining the Marks & Spencer (M&S) Manchester city centre store as a Customer Assistant. I’ve been with M&S ever since, working my way up to Section Co-ordinator, then Section Manager and finally Store Manager. 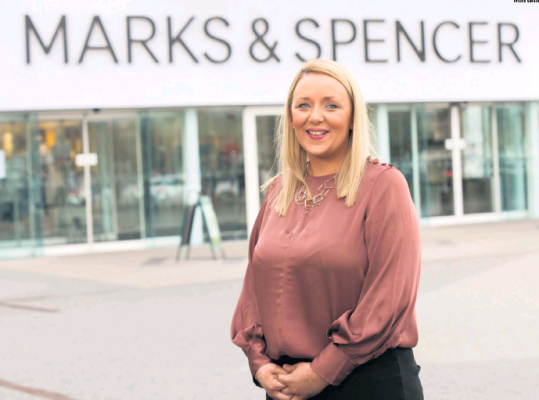 I have just recently moved back to Northern Ireland to take up the role as Store Manager of the M&S Newry Store at The Quays Shopping Centre. I had two favourite subjects – Maths and Art. I still enjoy Maths and love nothing better than solving a problem. Art on the other hand allowed me to embrace my creative flair. Did you go on to further/ higher education? After completing GCSEs at St Paul’s High School, I completed a GNVQ Advanced and then an HND in Hospitality Management with Ulster University, studying at Southern Regional College in Newry. After several years in hospitality, I wanted to branch out into a career where I could embrace my love of design and current trends. I really liked the idea of working in retail and being able to enhance the customer experience. I applied for a job with M&S which has given me the opportunity to make every moment special for our customers, as well as learn about all areas of the business – everything from visual merchandising to stock control, marketing to finance, buying to human resources. It’s also an industry where you can start at the bottom and work your way up. As a young teenager, I aspired to be a chef and then a joiner, along with many other sectors! However, I realised that retail could provide me with a varied and challenging career and the chance to learn valuable skills. Once I’d made the move to M&S and realised the variety of the day-to-day job, I knew retail was the sector for me and it’s been the best decision I’ve ever made! Throughout my career, I’ve received first-class training from some amazing M&S managers and mentors, which has been invaluable. Experience working with people is really important as I’m responsible for developing and leading my M&S colleagues to continuously develop themselves. There is a vast range of career opportunities at M&S and many different routes for people to reach their goals. The Graduate Management and Trainee Manager Schemes are both excellent entry opportunities to learn about the retail industry and the managerial skills required to become a Store Manager. Whatever your role and wherever your ambition lies, M&S is dedicated to offering tailored training and all the support you need to do your job well. Strong communication skills with the ability to demonstrate personal resilience are key, as well as having the confidence to influence and empower my M&S colleagues to deliver a first-class experience for our customers. Being highly organised, having attention to detail and a passion for finding ways to make the customer experience even better are also important qualities. Every day in M&S is different and that’s what I love about my job. As store manager I have overall responsibility for the store’s performance, including managing budgets, ensuring compliance with health and safety legislation and overseeing pricing and stock control. I’m passionate about talking to our customers on the shop floor and helping deliver the best possible service, as well as developing and coaching my team. The best part of my job is working with people – our customers and colleagues. I find it extremely rewarding delivering the best quality service to our customers, as well as watching my colleagues grow and develop. The most challenging part is keeping up with technological developments which are being adopted at an astounding rate as M&S continues to innovate and become a digital-first retailer. Connecting with our customers is at the heart of our business and technology is helping us to shape the retail experience fit for the future. What’s most important to me is the contribution M&S as a business makes to local communities through our Plan A initiatives. The M&S Make Your Mark employability programme, delivered in partnership with The Prince’s Trust, gives unemployed young people the skills and confidence they need to find work. Through our 21 M&S stores in Northern Ireland, we support many local charities including our regional charity, Action Cancer. If we can support the local community, bring out the best in our colleagues and give young people a better start in their careers, that’s incredibly rewarding. Anyone considering a career in retail should seriously think about M&S. The business really values its colleagues and provides plenty of opportunity for career progression with competitive salaries, bonus schemes and flexible working options among the benefits available. Throughout my career journey with M&S, I’ve tried to learn as much as I can from the people who do the job every day. I would love to be a zoo keeper looking after orangutans or elephants – quite different to retail! I love nothing more than a day spent shopping with my mum and sister, followed by a leisurely lunch. I then head home to enjoy a box set on Netflix with my partner Antoinette. What’s the key to any successful job search? It’s true what they say – if you do what you love, you’ll never work a day in your life. That’s exactly how I feel working at M&S.